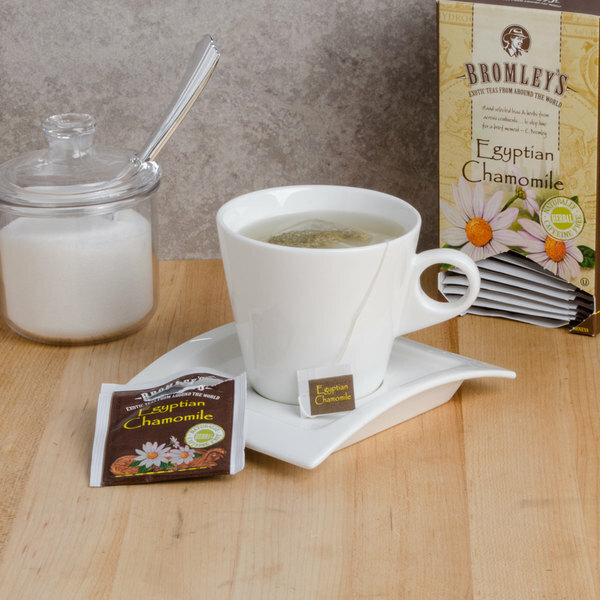 This exquisite Bromley Exotic Egyptian chamomile tea is made with pure Egyptian chamomile flowers. Known for its soothing and calming properties, chamomile is naturally caffeine free and easy on the stomach. It has a slightly sweet taste and fresh fragrance. Your patrons will enjoy taking in the excellent aroma and robust taste that this tea has to offer. Opposed to bulk tea, these individually-wrapped tea bag packets quickly and completely infuse flavor in each tea cup, while preserving the tea's freshness and taste. 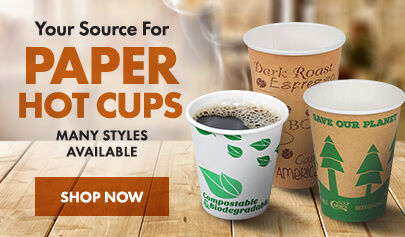 Allow customers to select these tea bags at your self-serve hot beverage station or hotel breakfast bar. They can also unwind and enjoy the revitalizing effects of this Exotic Egyptian chamomile tea at your coffee shop or cafe. This tea is also full of antioxidants to boost the body's immune system. Studies have shown that tea drinking has benefits that lead to a healthy lifestyle. Good for the muscles and the heart, it has also been found to boost exercise endurance. 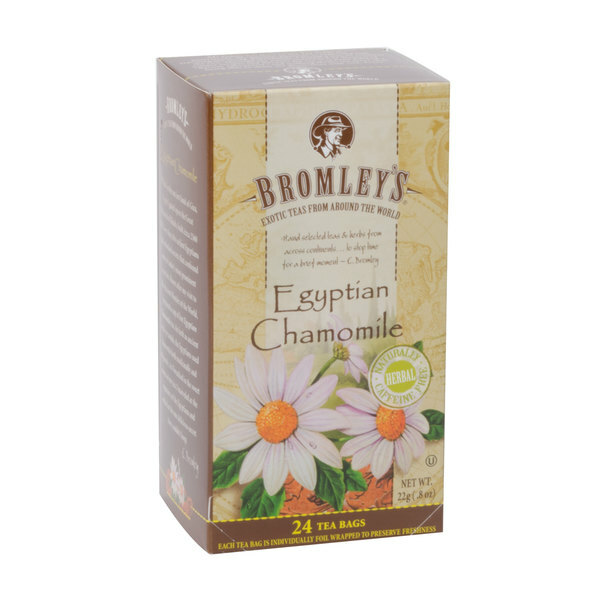 Make sure to always have fresh, hot tea at your venue with a supply of this Exotic Egyptian chamomile tea! Hot Tea: Use 1 tea bag per cup. Bring water to a boil and pour over tea bag. Brew from 3 to 5 minutes according to desired strength. Remove tea bag and serve with sugar, lemon, or milk. Iced Tea: Use 3 to 5 tea bags for each quart of boiling water. 5 bags will yield the strongest flavor. Brew for 5 minutes, remove tea bags, sweeten if desired, and pour over ice. 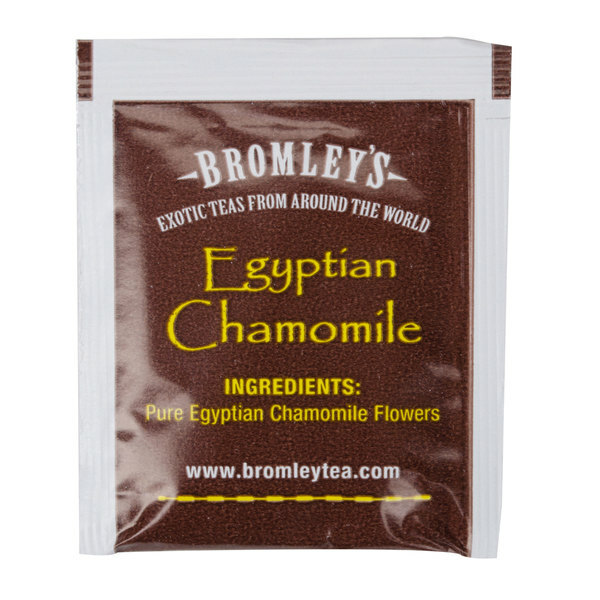 The Bromley Exotic Egyptian Chamomile has a wonderful flavor. It is a very fragrant tea that suites almost everyone. This tea hits the spot morning or night and everyone here at Rebel Raw raves about the taste. This is definitely a favorite tea, and I highly recommend it. Bromley teas are a huge hit at my cafe! The tea tastes great and is a premium quality tea. The price point is great, you can make a really good profit with this brand. Perfect for a chilly day, this chamomile tea is flavorful and relaxing in one cup. Our customers love it with a little bit of honey. I'm a big tea drinker and have tried many different brands. This brand seems to be there up there taste and quality wise with the big brand names at a much lower price. Great product for great price. The Bromley Exotic Egyptian Chamomile Tea tastes great and is as expected. I am very impressed by the price from webstaurant! This Chamomile tea is so refreshing - whether you drink it hot or cold. I use this in my business also. This tea does not leave an aftertaste. 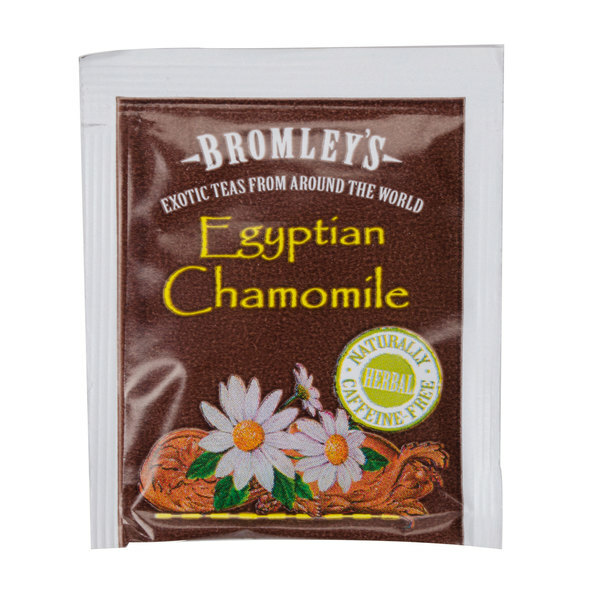 The Bromley Exotic Egyptian Chamomile tea is very soothing and a great bedtime tea. The chamomile helps relax me and puts me straight to sleep after drinking. Great relaxing tea with full of flavors! I drink this tea almost every night. It is a great way to unwind at the end of the day and helps me relax as I go to bed. Definitely buying more. this tea is so great. the flavor is impeccable and the price can't be beat. This is my go to tea right before bed. The wonderful flavor of chamomile is so incredibly soothing right before bedtime for a great relaxing sleep. A really flavorful exotic Egyptian Chamomile tea that is lovely and divine. We ran it as a special and everyone loved so now a regular menu item for us. Bromely Tea has a unique blend that all of their teas are wonderful, our office definitely notices a difference in flavor. 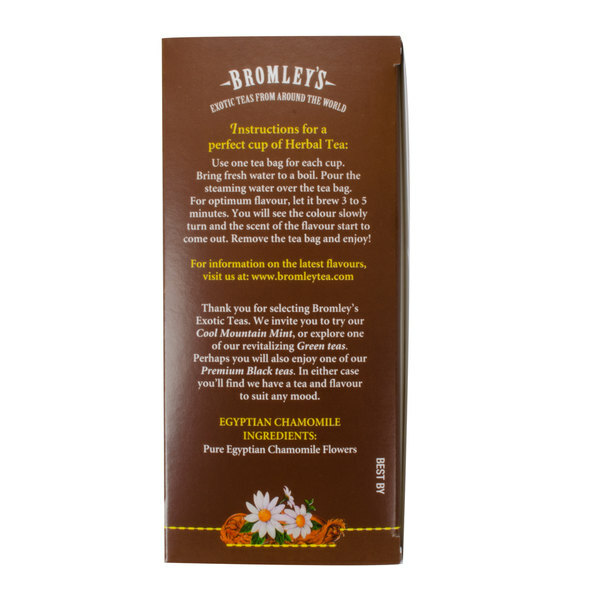 The men love Bromely Exotic Chamomile Tea, and I'm sure you will too! A superb quality tea bag that is great for commercial brewing or steeping in hot water. The Egyptian Chamomile tea is very soothing and tastes great. I love drinking this after a long day at work. Nice strong chamomile tea! My daughter was the first to try it and said it is a lot stronger than the wild chamomile tea her brother "made" by drying wild chamomile plants and brewing them. At such a low price per box of 24 tea bags, I am quote happy with this tea! 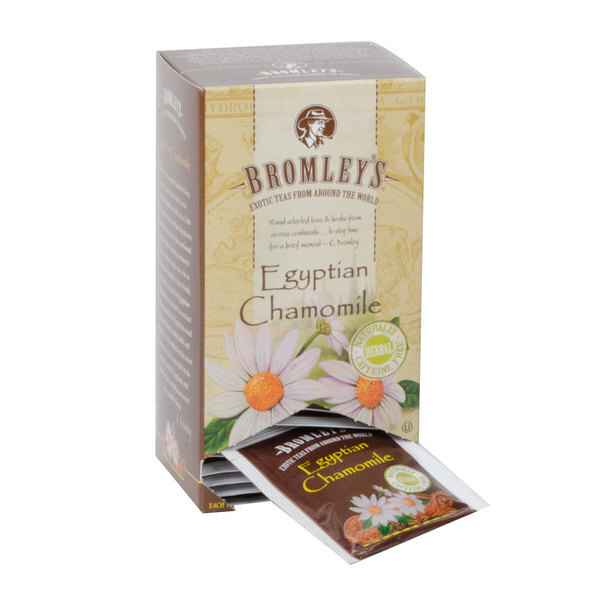 The Bromley exotic Egyptian Chamomile tea is soothing and full of relaxing smells and tastes. I love it and perfect for my hotel' s spa. This tea is delicious. It’s light yet tasty and all natural. Since it’s caffeine free, you can have a cup before bed. I enjoy some every night! This tea, as well as all the other Bromley teas are great. My son prefers this brand of tea over any other. He comments that the flavors of each are very strong. This bromely exotic Egyptian chamomile tea is absolutely amazing. This tea has a seeet flavor not too bold. Mixes nicely with cream and sugar. Doesn't take long to brew. For the price, I assumed that this would be a ho-hum chamomile tea, but it actually is one of the best that I've had. perhaps it is the individual wrapping of the bags, but the tea has a cleaner, fresher flavor than other bagged chamomile teas that I have tried.